Tandeming with a 2 Year Old! RIDING WITH A 2 YEAR OLD! If you are considering a setup for your child, Please remember us for sharing our experience with you when it comes time to purchase. The kid's and their college funds certainly appreciate you! We anxiously awaited the day when Courtney would reach the magic age of 3.5 years, the purported age when it is generally deemed appropriate to start children on tandems with a Child Stoker Kit. On rare occasion someone would report riding with a 3 year old but being impatient and realizing that she would turn 3 shortly before the snow flies. . . . . .well you get the idea. 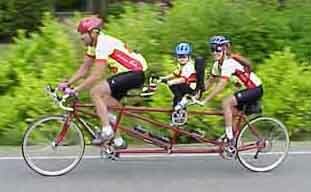 And then there was the Northwest Tandem Rally in late June. . .
Our setup utilizes safety devices that provide great security and peace of mind for all concerned, something we deem necessary for a child of this age. Courtney's participation has allowed her to literally be part of the "gang". She frequently rides 18-20 miles on many of our weeknight club rides and can often be heard singing one of her favorite tunes to which the other cyclists usually join in! A 30 miler with two or three stops is routine and certainly doable on most days unless she is needing a nap. A typical outing on one of our favorite routes includes one, two and possibly three playground stops. During the summer, we usually find an excuse to also visit the local Dairy Queen! When Courtney wants to stop at the DQ, we usually stop! The stoker is always right you know! Her longest ride to date was 45 miles at MTR 2000 in St. Charles, IL! The video, accessible below, taken at age 2.5 years shows the end result and virtually says it all! Following is an account of our learning experience and what worked for us. The rewards of having the family on the road together certainly made the endeavor worth while. The main obstacle to Courtney's active participation proved to be her rather marginal leg length or lack thereof. The circle formed by the rotating 125mm crankarms and the tread (q-factor or distance the pedals are apart) proved to be marginal at best for her size. An adult pedal spacing or tread causes the femur (upper leg bone) angle at the pelvis to increase rather markedly from that of a normal stance. By the same token, the angle starts to approximate that of a normal stance as the legs elongate with growth. The pelvis also widens as they mature so this is rarely a concern with older children. Observations of her pedaling action, while on the trainer mounted triplet, revealed that 70-85 rpm was an ideal cadence for her short legs and the relatively large circle she had to negotiate. Since our cadence often exceeds 100 rpm for short periods and Courtney would be pedaling continually, we chose to slow her down! We were able to have her pedal 17% slower by simply installing a larger chainring on her crank. We eliminated our concerns about loss of concentration or dozing off by adding a safety backrest equipped with securing straps. The backrest is made for a 1" seatpost so sizing shims were necessary to adapt to the 29.8mm seat mast utilized by Santana on our triplet. Over 21 mph average to the Lunch Stop! ...she was working! Add-on child bottom bracket holders mount about 1.5 inches in front of the seat mast as compared to traditional bicycle frame design where placement is directly in line with the bottom bracket. The resultant effect is a forward displacement of the pedal assembly, to the extent that one cannot compensate sufficiently by sliding the seat forward on its rails. The forward pedal assembly position causes a rather marked and undesired biomechanical change on the child stoker's part. We effectively solved the problem by utilizing a setback type seatpost that could be installed backwards and still permit leveling of the seat. Getting Courtney on the tandem involves leaning the bike against a stable object such as a building or a tree. One should be positioned in such a way so that the bike can be stopped from rolling away from the object should this ever happen. For safety's sake, one should always anticipate such. I always lift Courtney to the saddle and strap her in. 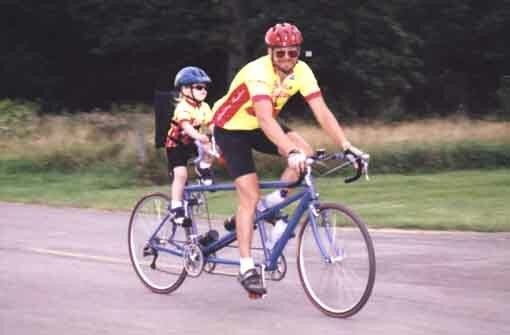 The alternative would be to have the child climb up on the tandem but that is a bit tough on paint... ...some folks do it this way though. She became surprisingly adept at getting her feet in the clips on her own in a very short period of time. We always secured her feet to the pedals with Velcro straps until she had ridden for about 3 months after which the straps were discarded. Initially we started off walking the bike around while doing unexpected stops and starts that taught her a natural grab and hold reaction. After a couple of initial confidence booster rides around the cul-de-sac, then down the road and back, we ventured out on our first 3 mile ride. It was certainly a success! Courtney had a blast! ...as we ALL did! Remember the #1 Rule in Tandeming? "The Stoker is always right!" This rule holds VERY true without regard to age. We have found a few key elements that pertain to the safety and continued enjoyment of family outings. The best rides we have are almost always early in the day or after nap time. It is also very important to monitor fluid intake and body temperature since little ones do not generate enough heat to stay warm on cool or cold days. We find it necessary to have her wear something that covers her legs and a wind jacket if the temperature is in the low 70's or lower. The wind and sun presence or lack thereof are also factors. A sure sign of drowsiness is silence and a bowed head, something that can be seen by the captain via a glasses mounted mirror. One of the many advantages to riding a triplet is that the rear stoker can keep a wary eye on the youngster in the middle. Dairy Queen and playground stops seem to be a universal requirement! Sometimes we stop at three playgrounds! Oooooops! ...that was already said but it bears repeating. Our rides are usually 10-28 miles dictated by time and our window of opportunity presented by Courtney's sleeping schedule. As previously mentioned, she has ridden 45 miles which was the Sunday ride at MTR 2000 but the last 15 miles were a bit much for her on that particular day. Virtually all stimulation from other riders ceased as we were ahead of almost everyone. It was also a dreary and rainy day at this point combined with the fact she was tired from the day before, not the riding but the 2 hours at the playground after the ride! Be sure to read "Tandeming and Kids" by Bill McCready, owner of Santana Cycles, Inc. also indexed on our Home Page under "Tandem Info". 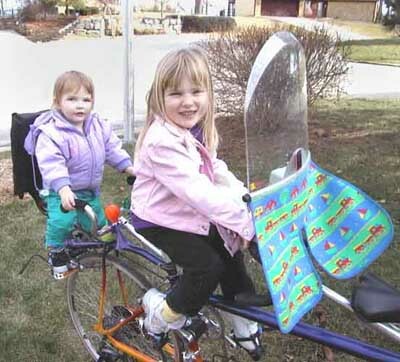 Bicycling is not without risk and riding with our precious children deserves all of your attention to keep them out of harm's way. 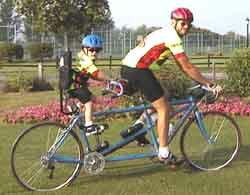 That said, riding with kids may not be for everyone as experience and skill levels vary a great deal. We all know individuals that fall for a variety of reasons 1-3 times per year, sometimes more. I think it is advisable to look at and accept one's history as one element in determining whether to take your children along on rides.